Wall Street didn't like what the tech giant and the motorcycle producer had to say about their earnings prospects for the coming quarters. For the second session in a row, stocks ended the trading day almost exactly where they began. 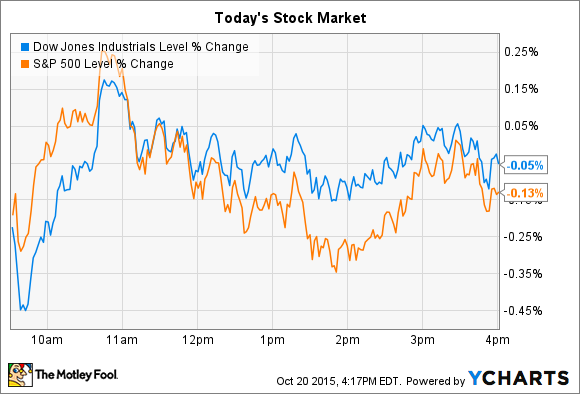 The S&P 500 (SNPINDEX:^GSPC) and the Dow Jones Industrial Average (DJINDICES:^DJI) both lost roughly 0.1% today. But since we're in the thick of earnings season, there were plenty large individual stock swings even in what seemed like a flat market. The two biggest today were tech giant IBM (NYSE:IBM), which was the Dow's biggest loser, and motorcycle producer Harley Davidson (NYSE:HOG), which led the S&P 500 lower today. IBM's fell 6% after posting disappointing third-quarter results. Sure, the tech giant's $3.02 per share of profit share was slightly above expectations, but that still represented a brutal 13% earnings drop compared to last year. Meanwhile, revenue didn't meet Wall Street's forecasts even as IBM lowered its profit guidance for the full year. The good news is that management's push to target products and services that are higher on the tech value chain is paying off. The strategic imperatives group grew 30%, and overall profit margin expanded by a percentage point to hit 50% of sales this quarter. "We made progress in the transformation of our business to higher value, with strong growth in our strategic imperatives and expanded operating margins," said CEO Ginni Rometty. Still, that progress won't be enough to overcome weakness in several of IBM's biggest markets. Its global business services division, for example, endured a 5% sales drop along with 1.3% lower profitability. IBM's sales and profitability by division. Numbers are on a constant currency basis. Source: IBM investor presentation. The turnaround in the services division is taking longer than expected, executives said in a conference call today. As a result, sales and profits should continue to slip as we close out the year. IBM lowered its 2015 earnings forecast to $15.75 per share, compared to the $16.50 it had projected three months back. Harley Davidson ended the day down 14%, making it by far the S&P 500's worst performer. The motorcycle manufacturer posted surprisingly weak third-quarter earnings results this morning: Its $0.69 per share in profit was no improvement over the prior year, and it trailed the $0.78 per share Wall Street was projecting. Quarterly sales of $1.14 billion also came up below expectations. Harley dialed back its full-year sales forecast due to increased competition. Image source: Harley Davidson. Management blamed increased competition for the disappointing results. Highly active rivals, especially in the U.S., drove a 1.4% drop in global motorcycle sales over the last three months. As a result, the quarter "did not unfold as we expected," CEO Matt Levatich said in a press release. Besides the softer demand, Harley also posted a significant drop in profitability as operating margin fell to 12.5% from 12.9% a year ago. Investors can expect things to get worse on that front before they get better. In conjunction with the results, management announced plans to boost spending on marketing and product development in the year ahead in a bid to get back to market-leading sales growth. "We expect a heightened competitive environment to continue for the foreseeable future, and now is the time for us to dial things up with significant additional investments," Levatich said. That's the right long-term strategy, given the decreased demand Harley is enduring right now. Yet it means shareholders will see lower profits as they wait for any sales rebound to gain steam. A turnaround won't come quick, though. In fact, management lowered their full-year profitability forecast from 18.5% of sales to 16.5% while dropping their full-year delivery expectations to 270,000 motorcycles from the earlier target of 281,000.